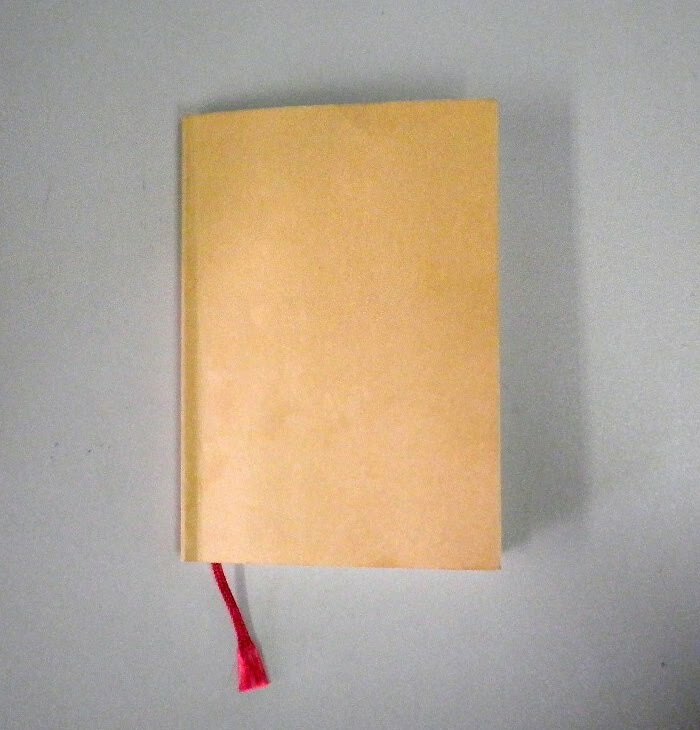 Muji carries some very nice notebooks in its stationery lineup, including this pocket notebook with dark ivory paper and a red cloth page marker. The dark tan paper cover is fairly heavy but the notebook itself is flexible rather than hard. The 5.75 by 3.75 size makes it ideal for pockets or purses, although the 144 pages means it is very thick (about a half inch or more) and therefore could be unwieldy. The paper is a bit darker than shown in the picture above, and not very fountain pen friendly (some bleed through). Gel inks and ballpoints work well on this very smooth recycled paper so if you just need to jot notes or make some quick sketches this is the right paper for you. Unfortunately the notebook isn't available online, but if you're around a store take a look at this pocket notebook. The coupon code above will take $3.00 off of our X750 Kompass Fountain Pens. Enter the code above in the 'Coupon Code' box on the View Cart page, then click 'apply' to see your savings reflected immediately. The coupon code above will take 20 percent off of our Leather Gift Boxes. Enter the code above in the 'Coupon Code' box in the View Cart page, then click 'apply' and see your savings reflected immediately. The coupon code above will take $5.00 dollars off of every SG2400 Kohle Pen purchased. I saw an interesting hexagonal ballpoint pen on Muji's website and was curious to see it in person, so off to a shop I went to have a look. But there were no metal pens like that in the store. What they did have was a ballpoint that looks like their aluminum fountain pen. Measuring about 5 1/3 inches when capped, the Mulji aluminum ballpoint has a needle point tip that produces a 0.7mm width line. The aluminum ballpoint has one of the nicest oil-based inks I've used in some time, although there is some blotting so smearing is likely. It's a light-weight pen, with a brushed grip that is easy on the fingers and a shiny, polished metal barrel and capt. The ink cartridge is one of the biggest I've seen, and surprising since Muji gel ink pens tend to use very think ink refills. The aluminum ballpoint is pricey ($16.50 plus tax), and may be in the phase-out stage as it's not on the website. It might also be an in-store only purchase, while the hexagonal ballpoint is online only. It's an interesting pen, and one that I'll be carrying with me for the times I need something other than a fountain pen to make a quick note. One of the more unusual pens I've found at the office is this Paper Mate Liquid Flair felt tip pen with a needle point tip. While billed as an extra fine, it actually has a 0.7mm line width so it's really more of a medium. The pen has a lot of different design elements to it: the clear plastic cap has an inside guard, like some of my Pilot Namiki fountain pen demonstrators. The end of the barrel has a blind cap that reminds me of a vacumatic filler, and it is loose enough to almost seem like it will come off and reveal a button filler system. The design on the barrel reminds me of a Benzene ring. Writing is smooth and the ink dries quickly so smears are at a minimum. It remind me of the Flair pen but in an updated format (more space-age). A few minuses: the design on the barrel is very obviously misaligned, so the rings don't match up. The solid gray bar along the barrel is misaligned as well, so you get this curving feature as you turn the pen in your hand. Just a bit sloppy, and hopefully an outlier. Otherwise, a very good pen for daily use. 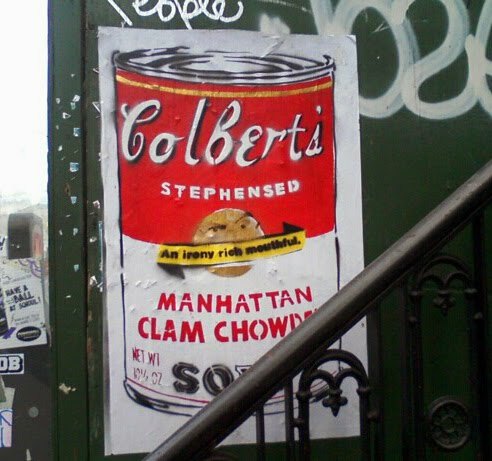 One of the posters popping up along 14th Street in Manhattan, this is on the side of an abandoned construction site near 8th Avenue. The railing gets in the way a bit, but otherwise a great ad for Colbert's Stephensed Manhattan Clam Chowder. Among the fountain pens I found at the Annex flea market some weeks back is this snakeskin/diamond diagonal style pen simply identified as "Vacuum" on the barrel and nib. The cap and barrel are slightly different greens, with the cap a darker green and the barrel lighter and more iridescent. I seem to recall that they were separate in the case when I found them, and likely came from two different pens that looked enough alike to make up one complete set. The pen itself is in decent condition: the nib still has a tip, the lever was working fine, and the pen just needed a new sac and some polishing (all done by 777PenRepair). The clip and band show heavy wear and brassing, but I find some wear on a pen a feature. I think about who used it before me, or how many owners it had before I came along. 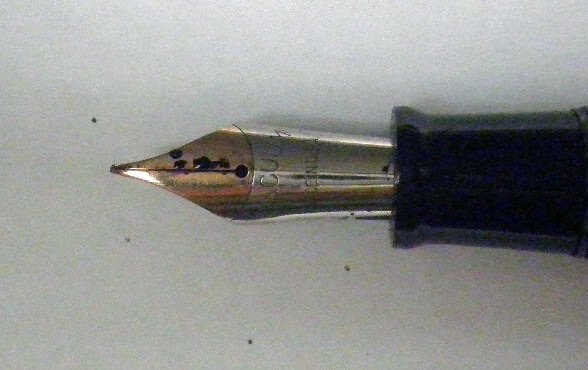 The nib is in good condition, while the entire nib/feed area just seems quite long--it's actually longer than the section and adds a nice touch to the overall look of the pen. As for how well it writes, this is one flexy nib! It's very wet as well, and the line is somewhere around a medium to broad. 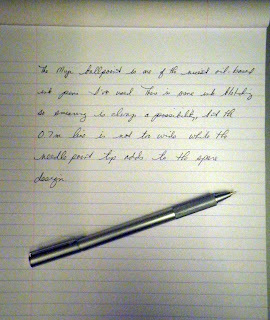 I've filled it with Noodler's LE Boston Brahmin Black and like the way the pen and line look when I'm writing. I haven't found anything on Vacuum fountain pens, not even old adverts. There were two I saw for sale on eBay and another auction site, but no information about the company. Likely this pen came out in the 1930s, when colorful celluloids added some cheer to a bleak and unrelentingly difficult decade. It's a great looking pen, even with the slight color difference between cap and barrel, and I'm hoping to find out more. In the meantime this Vacuum snakeskin gets a lot of second looks, quite rightly. 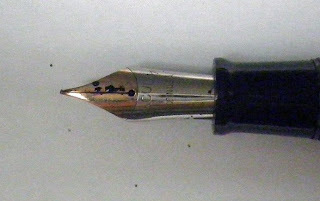 Vacuum-Fil Sheaffer sub brand circa 1935. Looks like Sheaffer changed the name to WASP by 1936. I'm not sure how these are always imprinted but the pattern of yours was in use by late 1936. Looking through Levenger's fountain pen listings I spotted this Galaxy Aurora with teal, purple, and white swirls and heavy silver accents. Very nice, but out of curiosity I went to eBay and discovered Levenger's outlet there, where they sell discontinued and returned/refurbished items. This Galaxy Aurora was listed as refurbished, so I bid and won. The pen I received was pretty damaged, with a bent nib and tines way out of alignment. When I tried to write I got a line that looked more like a small paint brush then a medium point fountain pen, so off the pen went for repair work. 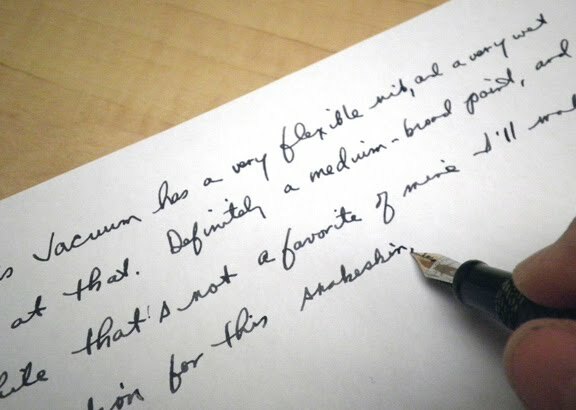 In short order the pen came back looking great and writing like a true medium nib. 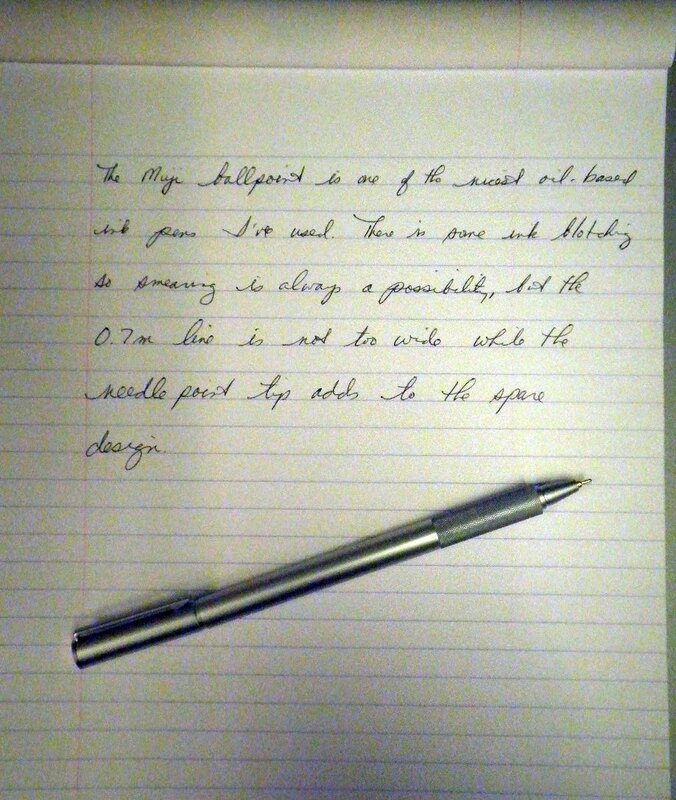 While I"m not fond of that particular width, it has more to do with the width of the lined paper I use rather than the nib itself. Smaller widths make my handwriting look too large for the paper, while unlined paper is best for me to write with using a larger width of nib. The pen itself is beautiful and fairly heavy, with a massive metal clip and section that add a lot of weight. As noted in the comments at Levenger, the converter doesn't fit quite right as the opening is slightly smaller than that of the point of the feeding tube. With some pressure it can work, but the converter does come off more easily when you're changing inks leading to spills and splotches. One problem with the nib is that the ink doesn't always flow, so I get some dry starts and skipping. This isn't a serious problem, likely it's easily corrected and more a result of the damage and repair than an original flaw. Beyond those quirks, this is a beautiful pen. The nib is very big to match the pen, which gives the overall impression of being quite light when in fact it is a bit on the heavy side. The color scheme is on the cool side, if you notice that thing. So if you're into big pens that make an impression, you might want to take a look at this Galaxy Aurora. Just be aware that buying one on that's been refurbished via Levenger's eBay store might mean you get a nib in need of repair. 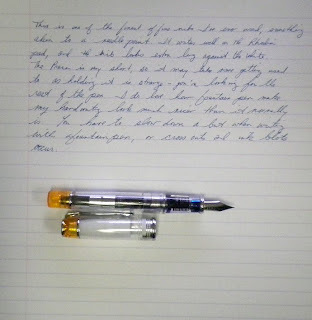 When JetPens introduced the Pilot Prera Clear Body I had already been looking at an orange-accented one on eBay and knew I was going to be making an order very soon. One of the first things you notice about the Prera is how small it is: 4.75 inches capped, 4.25 inches uncapped, and 5.25 inches posted. With small pens I sometimes look around for the rest of the barrel, and my hands look strange (like high heels with legs, long pens seem to make fingers look less stubby and more elegant). Other things you notice: the colored accent caps, which give it just a bit more appeal and making it more than a clear demonstrator; the frosted shielding inside the clear cap, which makes a nice contrast but also keeps ink splatters from being noticeable; the white embossing on the cap with the Pilot Prera names clearly identified but not overwhelming; and finally, one of the nicest clip designs I've seen on a fountain pen--sturdy but flowing, with a lot of elegance in one small detail. Clear demonstrator pens are among my favorites, I love to see the interior of the pen as well as checking out the ink availability. Unfortunately, that also means you can see any little thing that might be an annoyance, like the ink caught between the feed and section: when filling this pen, do not dip beyond the nib into the ink, as it will get into the section and you will have to take everything apart to clean it out. Lesson learned, hopefully. This is a fine nib but if you were looking for a similar type in a non-Japanese pen I'd say Lamy's extra fine nibs for the Safari and Al-Star models is probably the closest. It writes very much like a needle-point tip so if you like a fine to extra fine line but still want to read your notes this is a good choice. 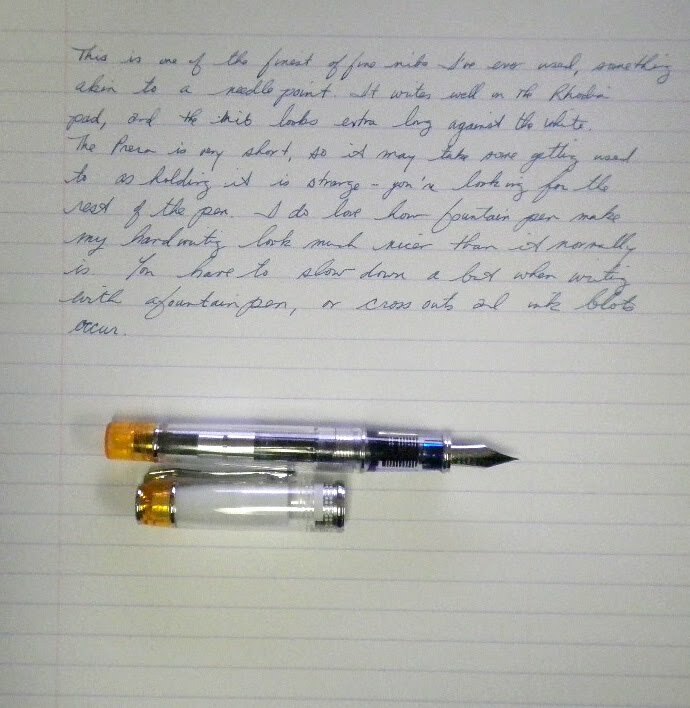 The Pilot Prera clear body fountain pen isn't as expensive as some, but to be honest there's not a lot of pen either. The accent caps come in lots of different colors if you are so inclined, which adds both choice and fun to the selection. If you're thinking of a new fountain pen, take a look at Pilot Prera. calle d Notes de Memo Baby Color, double ring bound notepad that feature vinyl front and back covers in a reporter-style format. The baby color is pastel, and there are five colors to choose from, including the mint, blue, and orange above. Not a bad little notepad if you need to jot a line or two. The pad has 13 lines with 6mm spacing, and the top is scored so you can remove the paper without tearing it from the rings (and creating confetti and ragged ends). 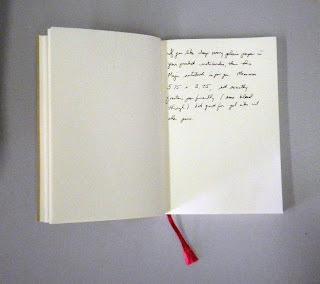 There is no hard back to this notepad, so notes need to be kept short or you need to find a surface that will support the paper. Definitely cute, and pretty easy to carry in a purse or pocket. The Baby Color heading may be too cute for those used to the more grown-up Field Notes and Doane Paper, so these might be of greater interest and use for a younger, budding notebook and paper addict. They are available at Kinokuniya, and likely other stores that carry Japanese papers. Looking through Diamine inks at Art Brown, I thought I'd given this Diamine New Century Teal a tryout. The swab is next to Diamine's Twilight for contrast, and you can really see that this Teal has more green in it. Writing in a Sailor Reglus fountain pen with a fine nib, the Teal looks very green with just a hint of blue in it. The Teal isn't waterproof, and it does take a few seconds to dry. If you're looking for a blue-green that's heavier on the green then Diamine New Century Teal is a great choice. This is really the color I was looking for when I bought Iroshizuku's Syo-Ro, which is described as dark turquoise but seems less green. 777 Pen Repair is a great new blog with some really helpful and interesting posts, including this latest one on three pen repairs. These happen to be my pens and I can't wait to get them back, especially that very interesting green snakeskin. 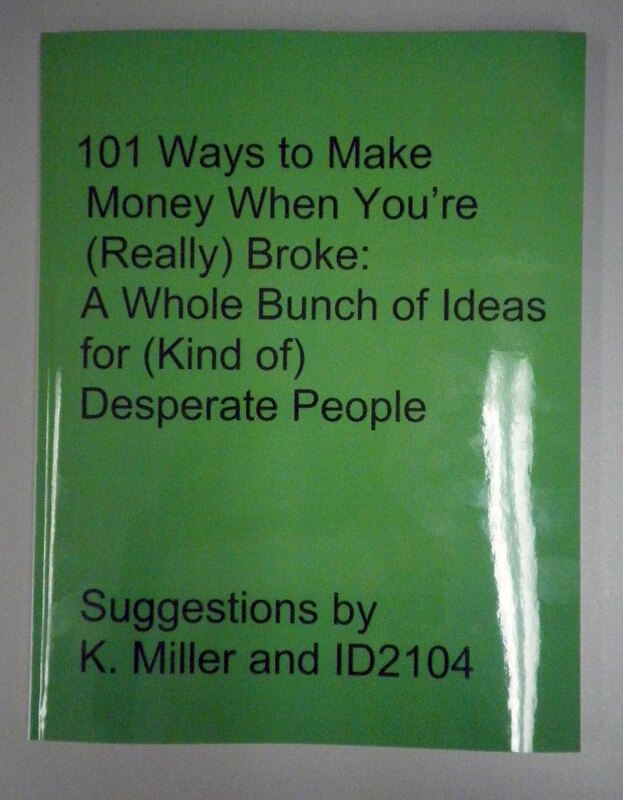 My colleagues have published their own self help book, 101 Ways to Make Money When You're Broke. It's something of a workbook and journal combined, with lots of interesting suggestions to make money and space for notes, drawings, prayers, and anything you want to put in. Not exactly a Webbie, but helpful and fun so take a look. A new stationery blog and online store launching in Spring 2011 (around May, I think I read). Some great photos and commentary, and I love the mint carry case. Here is Speck's take on the dip pen, a chopstick instead of bamboo. I was really delighted with these notepads when I saw them at the March Long Island Pen Show, produced by Richard Binder especially for fountain pen use. There are six bright white notepads (5.25 by 8.5) featuring a different high resolution reproduction of a vintage fountain pen. My favorite is the golden brown striated Sheaffer's Crest from around 1938, but each pen is beautifully detailed and as much a miniature poster of a great-looking fountain pen as a notepad. Second sheet is also available if you want to use this as stationery, or just don't want the pens getting in the way of your writing (although according to the website the photos can be written over with no skipping). I love this paper, which is smooth but not impermeable (it's uncoated, which makes a big difference). Fountain pens glide over it, the ink doesn't smear as it is drying fairly quickly, and there's something great about the feel of this premium paper that makes it the equal to Rhodia and Clairefontaine. The price is good ($18 for 6 notepads), and the whole look sets it apart as a very high-quality niche product. 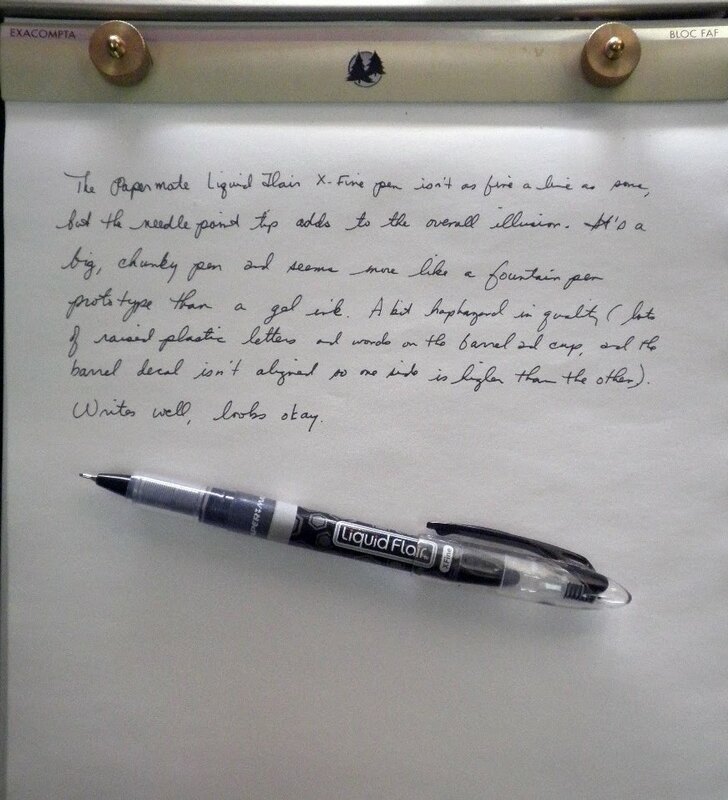 Check this out at Richard Binder's site, and if you're ordering something consider adding a set of fountain pen notepads to your haul. A great idea, the homemade bamboo dip pen. Saw this Clairefontaine notepad at the LI Pen Show in March and was really taken with the polypro front and back covers in five really bright colors. At 8.5 by 12, this top-bound double spiral notebook has a very substantial chipboard backing; the ribbing in the covers adds some stability as the front and back interlock and therefore don't allow any sliding. It's as if you have a double thickness of board to hold the notepad steady, and it works quite well as I wrote most of the below at about an 80 degree angle. The 80 sheets of bright white paper in Clairefontaine's signature 90 gsm weight is everything you want to write on: smooth, easily readable, fountain pen friendly but not overly so (the ink didn't take forever to dry). If you have to write using your lap as your backboard there are two notepads to consider: this Clairefontaine Linicolor (which you can find in a medium size as well as large) and the Field Notes Steno Notepad. Both have extra-strong backing for non-desk writing, so the question is whether you want bright white notepaper or steno-style paper. I finally got around to picking up a pack of the re-designed Sharpie fine markers, and love the new look. I also am glad that Sharpie put the elusive purple, orange, and green markers in one package, so I can have my favorite colors all together rather than mixed in with the black and blue and red ones (kind of like buying M&Ms for the green ones). The new design is very attractive and user-friendly, the grip doesn't cramp the hand and the curves of the plastic mold make this more contemporary and less hard-edged than the original fine markers. Silver and black is one of my favorite color combinations, so I'm pleased to see it used in a nicely-designed Sharpie everyday marker. The Sharpie fine markers don't bleed through the paper, so they are great to use instead of an ordinary gel ink pen. The green marker is a bit light, but the orange and purple are bright and engaging on the paper. Sharpie fine markers are a great addition to their product line up, and the silver and black design makes it an even better choice.